“Violinist Fritz Kreisler was one of the most beloved and best known of early recording era musicians. His burnished tone and patrician phrasing were quintessentially Viennese, and the warmth of his playing won him devoted followers wherever he appeared. So great was his fame and the affection in which he was held that he survived a blaze of controversy when he revealed in 1935 that many of the short pieces he had performed as transcriptions of such composers as Couperin, Vivaldi, and Pugnani were, in fact, his own work. While the critics fumed, the public expressed little concern and continued to pack his concert appearances. 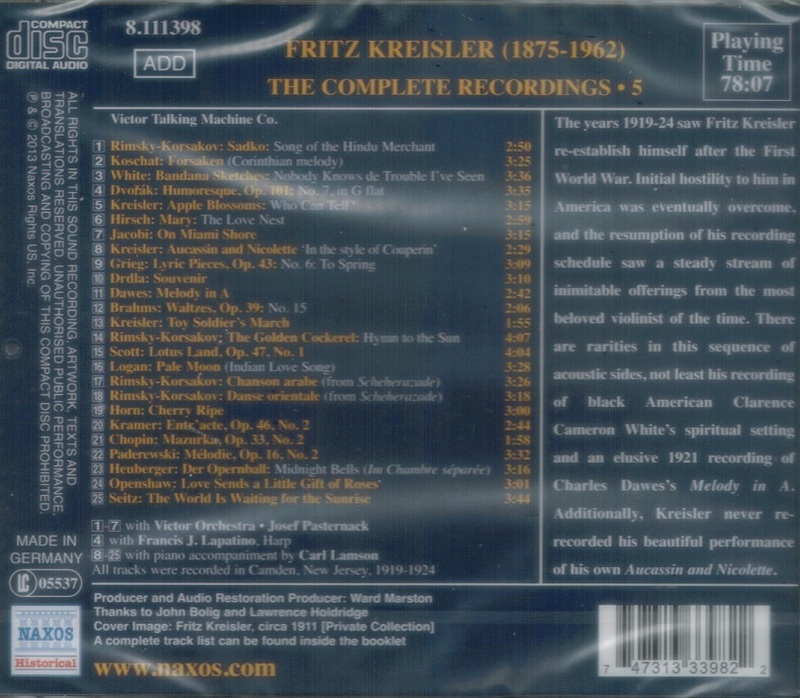 Kreisler was the son of a famous surgeon, a good amateur musician who gave young Fritz his first violin lessons. 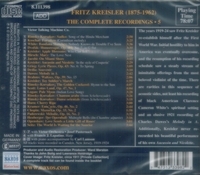 Kreisler made his public debut at seven in a collection of short works. Shortly thereafter, he was permitted to enter the Vienna Conservatory despite a policy that no one younger than 14 be accepted. After three years of study with Joseph Hellmesberger, he was awarded a gold medal. Kreisler was sent to Paris for further studies with Delibes and Massart. At the age of 12, he won the Premier Grand Prix de Rome gold medal competing against 40 other players, all of whom were at least 20 years of age. 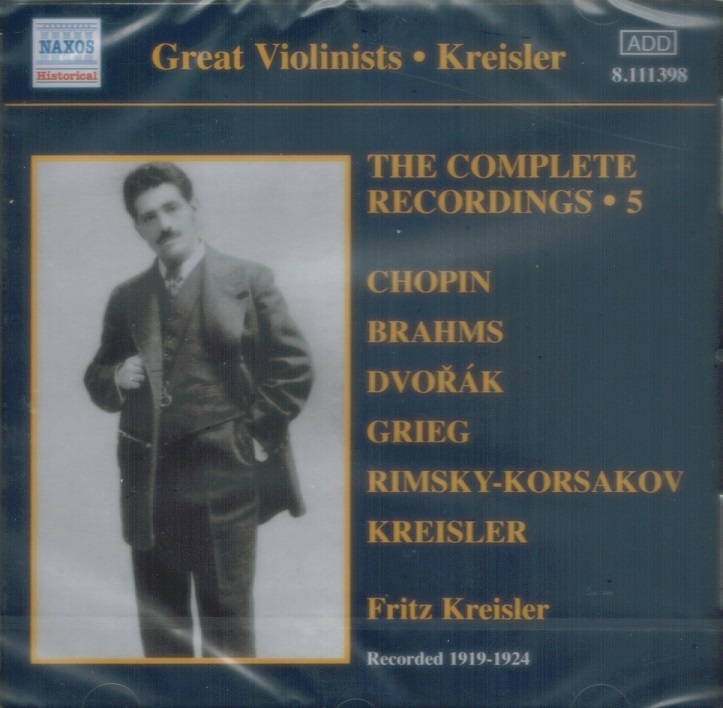 In 1888, Kreisler sailed to the United States for a concert tour with pianist Moriz Rosenthal, earning many complimentary reviews. When he returned to Vienna, he applied to the Vienna Philharmonic for a position but was turned down. Feeling discouraged, he resolved to abandon music and chose to pursue a career in medicine. After several years, he rejected that course and began the study of painting. First in Paris, then in Rome, he worked toward mastering his technique, but soon this, too, became tiresome. He returned to Vienna and enlisted in the army. A full year as a soldier was sufficient to cause yet more rethinking and Kreisler resigned his commission and returned to the study of violin. He spent eight weeks in country solitude readying himself for his return to the concert stage. His "second debut" in Berlin was successful, but widespread acclaim came during several American tours between 1901 and 1903. In the United States, he was hailed as one of the foremost violinists of his time and, soon after, Europe followed suit in recognizing his extraordinary artistry. In 1910 in London, Kreisler gave the premiere performance of Elgar's Violin Concerto, a work dedicated to him. While vacationing in Switzerland in 1914, Kreisler received the news that Austria was at war. Returning to his native country, he rejoined his former division, now stationed in Galicia. An attack by the Russians resulted in an injury and his discharge with high honors. Wishing to help his country, Kreisler embarked on a lengthy concert tour of America. The United States' entry into the war, however, put him in the awkward position of being an ex-Austrian officer aiding what was now an enemy nation. Negative reaction obliged him to withdraw from concertizing and retire to Maine to pass the remaining period of hostilities.